Ubercode Software is a startup ISV run by William Rayer. My purpose is to make computers and programmers smarter with two products: Uberbot which is an AI (Artificial Intelligence) application, and Ubercode which is an easy-to-use programming environment for Microsoft Windows. The Uberbot is an AI application which stores concepts (ideas) in its 'brain'. You ask it questions and it gives the best answer it can. Uberbot understands simple questions such as What is the capital of Norway, Is an apple bigger than a grape, What is the derivative of x squared etc. Uberbot entered the Loebner Prize and came 5th in 2013 and 3rd in 2014. 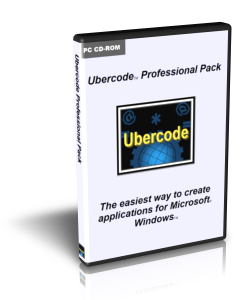 Ubercode is an easy-to-use programming environment that helps you create apps for Microsoft Windows. It creates standard EXE files with a minimum of fuss, and lets you package the EXEs for redistribution or sale. The language is easy to understand and comes with example programs and online help. The Money Back Guarantee means you can try Ubercode with zero risk. Buy Ubercode now risk free! All products include a manual, the full Ubercode environment and a money-back guarantee. Download the Ubercode free trial now. Learn more about the Uberbot AI program. Learn more about the Ubercode programming environment.